Ch. 1. What is Art? Part 1. 8. The Matter of Art and Artist. ​Art in Zambia 1: Tribute to Fackson Kulya, folk artist. A brief biography of Fackson Kulya, some reproductions of his work and some observations about his art. 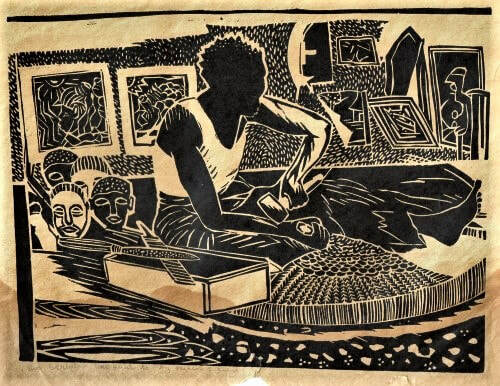 Banner image: detail of The Sculptor, lino print by Fackson Kulya. First published: 11 November 2011 in the Art in Zambia blog (URL https://artblog.zamart.org). In deciding what or who should be the first of this series labelled “Art in Zambia” I choose Fackson Kulya. For two reasons. One reason is personal and perhaps incidental. Fackson was the first Zambian artist I got to know in 1975 when I started a five year spell as full-time artist in Zambia. The other reason is neither personal nor incidental. Fackson, had he still lived, today (i.e., 2011 at the time of writing) would be well in his sixties. Fackson died around the year 2000, literally out of sight, probably somewhere in the Luanshya country side. He originated from there and was a Lamba by tribe. None of us, his friends and co-workers in the second half of the seventies, knows the details and we only heard that he was dead long after he had been buried. Fackson does not deserve to ‘disappear without a trace’ out of the Zambian art scene. The significance of Fackson Kulya as an artist is acknowledged by his inclusion in the ranks of artists with a dedicated page in the book “Art in Zambia” (2004) by Gabriel Ellison (extensively aided by the Book Publishing Committee of the National Zambia Visual Art Council). He was a self-styled artist, a sculptor, graphic artist and painter. Most of his sculptures are in wood, but in 1975 he also tried bronze casting. His graphic career started in 1975 when he, prompted by me, became one of the founding members of the Lusaka Artists Group. The following year Patrick Mweemba and David Chibwe joined the team and later on Style Kunda became a regular member. The members of the Lusaka Artists Group, later renamed the Zambia Artists Association, worked together at a studio at the Evelyn Hone College. The space had been made available by the College and was supported by the Art Centre Foundation. The members, by working together in an accessible place became visible and known. Smaller and larger commissions were received; working together helped to create a conducive and innovative atmosphere. It was in this setting and period that Fackson could develop into a mature artist. In this time he was commissioned to a relief in wood depicting the eagle which is a symbol for Zambia on the Zambian flag. Photo 1. The Sculptor by Fackson Kulya. Lino cut, around 1978. 25 x 19 cm. Fackson, in the reproduced print above, depicts himself working at the Evelyn Hone College studio from where the Lusaka Artists Group operated.﻿ He is sculpting the commissioned wood relief of the Zambian eagle for the House of Parliament. He also was one of the artists who did the mural paintings at the Longacre market around 1978. Several collectors commissioned or bought medium sized wooden sculptures by him; usually done in mukwa; mostly about ‘traditional’ themes of the mother and child type and executed in some sort of conventional primitivism. Sitting on a bad branch. Linocut by Fackson S. Kulya. 12.5 x 23 cm, around 1988. Collection G. Witkamp. His more original work was graphic or in paint. In these media it was easier for him to allow his at times bizarre imagination to directly express itself in pictures that often were fantastic, humoristic and rooted in folklore. Fackson, other than his academically trained colleagues circulating in the higher strata of society, is best described as a folk artist. These were his roots and that was his way of life. The blessings and curses of formal education bypassed him. In the eighties he returned to Luanshya rural. Town life was too hard for him. He continued, however, to make art. At that time Lusaka had only one permanent gallery, Mpapa Art Gallery. It at first was located at Chachacha Road and later moved to a fine location, Mwilwa Road, in the Rhodes Park area. In that gallery, in 1991 and 1992, I found three paintings by Fackson, probably just dumped by him in the hope of an eventual sale, or perhaps unsalable leftovers. All of the same size, in the same medium and stylistically similar. I bought them and one part of this trilogy is represented below. He now is king probably was made towards the end of 1991 and perhaps has been inspired by the presidential elections of that year which ushered in multiparty democracy. He now is King. 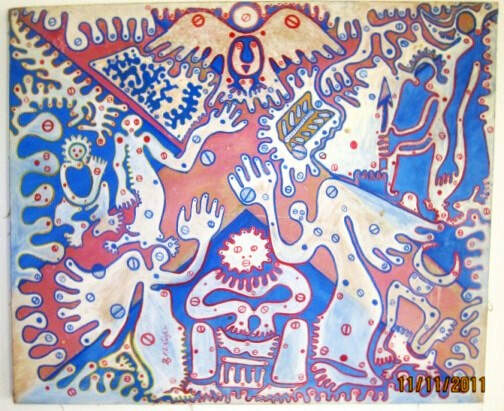 Fackson Kulya, about 1991, pva/acrilic on cloth, 90 x 75 cm. Fackson surely was not a socialite. He is not remembered because of all the committees he was a member of, or because of his networking skills. He was not a committee member. He was never nominated for any of the awards handed out by the National Arts Council. People like Fackson are not important enough, their lives are too far removed from the mainstream of what is considered artistically relevant. He did speak English – and thought of titles for his work in it: but always from a Zambian perspective. His work now is scattered – he is not well represented in any major private or public Zambian collection. He was not a trail blazer. He did not rank amongst the big names that shaped art in Zambia. But he was an original artist, making imagery his own way. He did not try to please or provoke, to be fashionable or unfashionable. He just made pictures as he liked it, the way musicians like Short Mazabuka, Green Mamba or Mashombe Blue Jeans make their music. Folk music of a syncretic kind. Fackson’s work is not contrived, it is honest and has locality. It has zambianess about it – something hard to describe but you can feel it, coming from the heart. Patrick Mweemba kindly helped me on factual matters of Fackson’s life. Fackson Kulya, folk artist (see Art in Zambia blog). * The author is an artist, cultural anthropologist and internet publicist working in Zambia.